A delightful approach down the deeply wooded Lamorna Valley leads to the famous Lamorna Cove and the glittering sea of Mounts Bay. Nature has taken back this centre of Victorian industry where quarrying for high quality granite began in 1849. 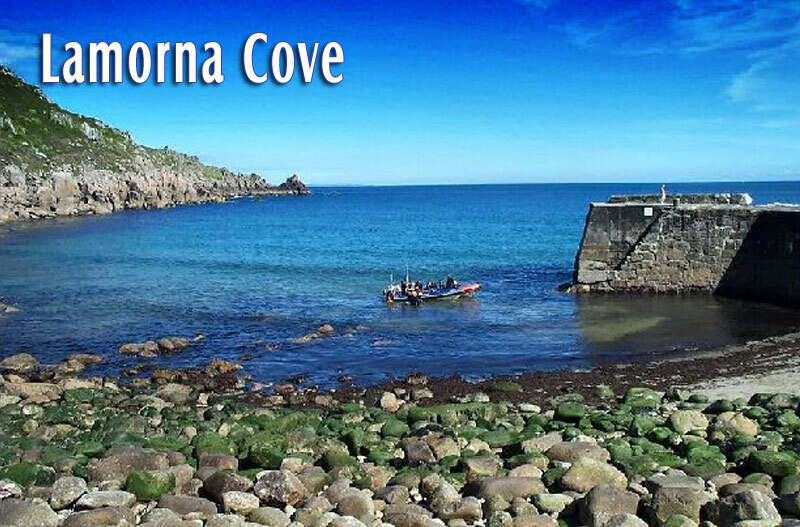 Lamorna Cove has a small quay which is occassionally used for fishing. The Slipway at lamorna is exposed to the elements and boats have to be dragged up the slipway in bad weather. The harbour is constructed from the granite blocks, which were quarried locally and then shipped from Penzance to various destinations. The granite was of a high quality and coniquently used in the construction of many local buildings and wharves. The remnants of this trade can still be seen strewn on the hillsides around the cove but the quarries have been long derelict. Originally, A timber jetty was first used to load the granite onto ships but this was replaced with a stone pier in 1854. Heavy seas often delayed loading the stone and threatened moored vessels. This raised the price of Lamorna granite and sea transport was abandoned in favour of difficult but regular transport overland to Penzance. The quarries ceased production in 1911. Today all is peace and beauty in Lamorna. In the early 1900s, the areas exquisite landscape attracted painters of distinction, such as Harold and Laura Knight, Lamorna Birch, Dod and Ernest Proctor and Sir Alfred Munnings.